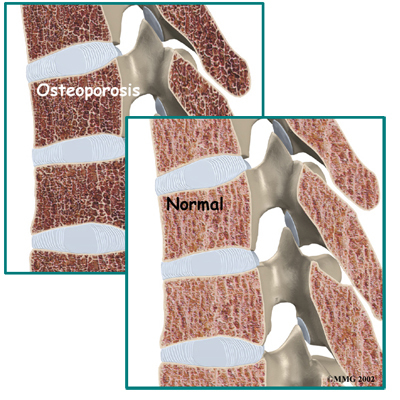 Welcome to Advanced Physical Therapy & Sports Rehabilitation's resource about Osteoporosis. Patients with osteoporosis or those at risk of developing osteoporosis will benefit from working with a Physical Therapist at Advanced Physical Therapy & Sports Rehabilitation. The goals of our Physical Therapy treatment is to educate you on proper posture, teach you safe ways of moving and lifting, and to provide you with exercises you can do at home to help prevent a decline in bone mass and prevent fractures. The exercises we prescribe will particularly focus on activities that help to increase the strength in your bones, as well as exercises that help to maintain or improve your balance. Optimum balance helps to decrease your risk of falling, which can easily fracture an osteoporotic bone. We will also suggest exercises for your flexibility to help decrease the stress placed on the bones by tight muscles as well as improve your overall mobility. If you have experienced a fracture from osteoporosis, Physical Therapy at Advanced Physical Therapy & Sports Rehabilitation can also help with controlling your pain and gradually returning you back to your regular activities. Weight bearing cardiovascular exercises such as walking outdoors or on a treadmill, gentle non-pounding forms of dance, and stair climbing are useful activities to put weight through the bones and encourage an upright posture while also improving cardiovascular health. Cycling is not a recommended activity as it does not provide the benefits of weight bearing and it also encourages the detrimental flexed forward posturing of the spine. Pool exercises are not weight bearing either so are not recommended unless severe pain from osteoporosis limits physical activity on the land in which case exercising in the pool would be acceptable and recommended. High impact activities such as running, jumping, and pounding forms of dance should be strictly avoided. Your Physical Therapist at Advanced Physical Therapy & Sports Rehabilitation can educate you on safe cardiovascular activities specific to your interests and your physical needs. The final component to our treatment at Advanced Physical Therapy & Sports Rehabilitation will be to provide you with some flexibility exercises. By improving and maintaining your flexibility, the stress put on your bones by tight muscles will decrease and the ability to practice good posture and body mechanics will be improved. Good flexibility also improves your mobility, which in turn improves you balance and decreases your risk of falls. Stretches for your upper back and chest in particular will be prescribed to decrease the likelihood of developing a stooped posture. Stretches for your hips, calves, and neck are also important if you have osteoporosis and will be included in your stretching regime. Your Physical Therapist will continue to compare your test results of body height, posture, strength, balance, and flexibility to see how well you are improving and to encourage you in continuing with your exercise program. Once you can safely and proficiently perform your home exercise program, regular visits to Advanced Physical Therapy & Sports Rehabilitation will not be required, however, we will continue to be a resource for any further questions you may have or problems you may encounter. If you are seeing one of our Physical Therapists at Advanced Physical Therapy & Sports Rehabilitation because you have recently had a fracture related to osteoporosis, our treatment will start with a focus on decreasing your pain. We may use hands on treatment as well as modalities such as ice, heat, ultrasound, or electrical current to assist in managing your pain. We will liaise with your doctor to determine the most appropriate time for you to begin the more advanced exercises involving strengthening, balance, and flexibility as outlined above, and will proceed with them as appropriate in order to allow you to return to your normal activities as quickly as possible.